Oh Mother I've trusted you much, please listen. You are the substratum of entire worlds. Oh Mother , you are the primordial energy. Please don't be indifferent. Isnt this opportune moment for supporting me? Brahma, Vishnu and Maheswara adore your feet. 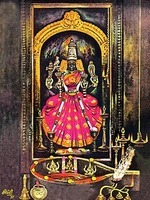 Oh Devi there no one who is equal to you. Indra the Lord of Devatas and sages extol your unparalleled greatness. Please bestow me boons and protect me. Oh Mother, you are protector of Syamakrishna. O Lotus eyed , the one who grants desired material welfare. Your abode is Kamakoti Peetham, the seat for sacred learning. I do not know how to thank you for all these wonderful contribution. I always open the e-mail box looking forward for Amirthavarshini. I have a separate column for you. May God bless you with best of everything.